THE TRAPPIST monks are another ancient and rigorous church order. They came to our region, namely to Delibašino Selo near Banja Luka (which is today a part of Banja Luka) on June 21, 1869, guided by a Tyrolean monk, father Franz Pfanner. He established the well-known convent «Marija Zvijezda». The Trappist principle is: “pray and work”. By doing this, the Trappists have considerable influenced the development of this region on a religious, spiritual, economic, educational and charitable level. After World War I, they were the most powerful convent within their order. During World War II and later, they were left with only a very small number of members; their premises were nationalized and they were forced to survive on an absolute minimum. Today, they assist the parish of «Marija Zvijezda” that has been entrusted to them. The address of the convent of “Marija Zvijezda” is identical with that of the parish office of Marija Zvijezda. 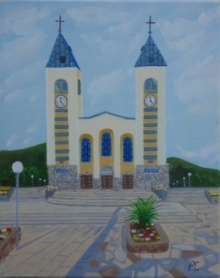 The parish has four chapels: in Česma, Mađir and Priječani, as well as on the St. Ivo cemetery in Delibašino Selo, and three cemeteries (Priječani, Česma and St. Ivo in Delibašino Selo). Those small chapels shared the destiny of many other parishes in the last decade and were equally injured.